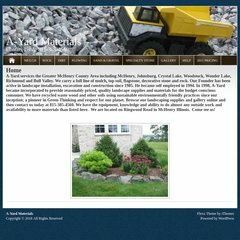 a-yard.com McHenry County Landscape Supplies, rocks, gravel, mulch | A-Yard ..
a-yard.com McHenry County Sand, Gravel, Driveway Material, A-Yard | A-Yard ..
American Registry For Internet Numbers (Virginia, Chantilly) is the location of the Apache server. A-yard.com's server IP number is 97.74.144.137. Its 2 nameservers are ns52.domaincontrol.com, and ns51.domaincontrol.com. PING (97.74.144.137) 56(84) bytes of data. A ping speed test response, is timed at 55.5 ms.